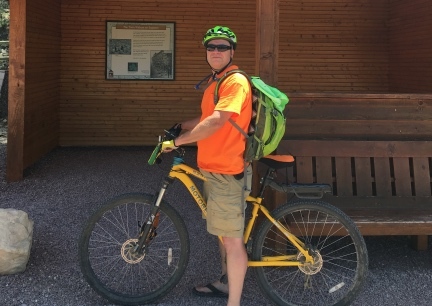 Deron and I started riding bicycles again not just for fun, but also for our Health. It has paid off for us. We have been riding over 1000 miles a year. Our Heath has much improved and I lost 70 pounds. 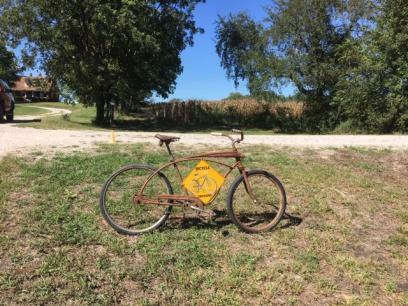 When we started riding bicycles again we lived so far out we would have to load our bicycles up on the vehicle and take them to town so that we could ride them. So we bought Discount Store Bikes to see if we would even do this. We did. Our Health Improved and I was losing that fat I had accumulated on my poor body. The Walmart Bike served us very well and in fact I even made Panniers for mine, then had Deron make Hard Sided Panniers for it. 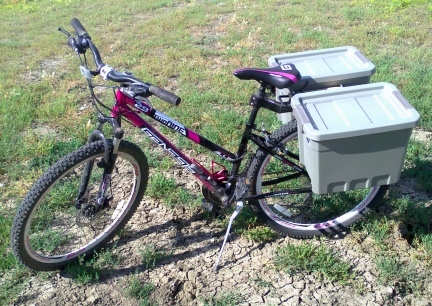 My bike was given to a long legged friend, after I upgraded, but I kept the Panniers. We upgraded to nicer 29" Mountain Bikes. We are both long legged and LOVE that these bikes have all that leg space. We ride our Mountain Bikes most of the time. Our bikes we used to ride hundreds, thousands, of miles when we raced Sled Dogs are still in WI and we need to get them here! Deron has a High End Road Bike and I have a really nice Hybrid. Worse. We still have bicycles in SD too. We still own that property, we just need to get back there and get those bikes! When I first saw FATTYS I fell in LOVE with them. Deron bought me one, I rode it everywhere in all seasons, and talked him into buying one too. He bought a Higher Quality and it was not long Deron started trying to talk me into buying a Better Made FATTY.....I have not yet, but have been looking. In fact when I upgraded from my Discount Store Bike, I went with the FATTY. My Mountain Bikes came later. We lived in SD at the time and SD has a LOT of snow each year. YES! 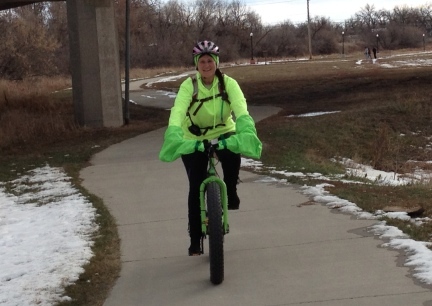 We did in fact get out and enjoy it on our FATTY Bikes! A few times Deron was like a 12 y/o boy, speeding up, hitting the breaks and sliding sideways, with a HUGE smile and often a laugh. Deron and I make a lot of our equipment and Deron is also our 'wrench' (bike fixer and keeper upper). I made our Poggies from my own pattern. After much 'gourding' I finally talked Deron into buying a FATTY for the snow. He bought a NICE one and once it arrived, he wanted me to upgrade mine! YES! He loves that FATTY! 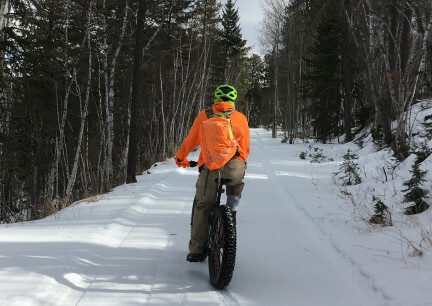 Not just fun on snow....any day of the year is a good day to ride a FATTY! 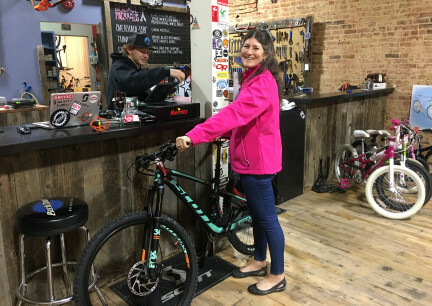 After a lot of 'shopping' and Deron did a LOT of Internet Research, we decided, for me, on the Scott Contessa Spark 720. THIS BIKE JUST WANTS TO CLIMB AND JUMP! I told Deron I thought my Contessa was disappointed in her new owner...she wanted someone that took the more Technical Trails! Man! I have to add....with this Bike being fully suspended....IT IS THE BEST ROCKING CHAIR AN OLD LADY CAN LOVE TO RIDE! I had wanted a use Road Bike again for a while. I wanted a used Road Bike, so that I could make sure I COULD EVEN RIDE A ROAD BIKE AGAIN. I am old and my back....and my shoulders, and my..... 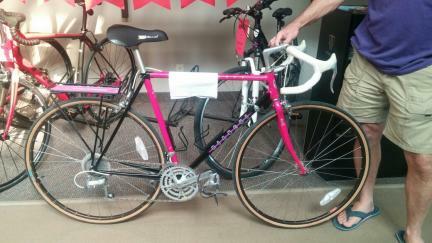 I was watching Craigslist for a $40 Road Bike...when we found this PINK Bianchi in a Bike Shop in Columbia, MO. We paid more than the $40, (the taxes on it were about that) but I am so glad to have THIS BIKE! Not only is it pretty, it is well made and in MINT condition. Everything is tight and right on it. Funny. I get Bicycle Magazines. I have shown photos of Bianchi Road Bikes to Deron saying...."If I won the Lottery...", and "If I ever got a Road Bike again..." BAHAHAHAH BAHAHAHAH Who Knew!? God is so Good to us! I bought it for Parades and Shorter Group Rides. I also want to make a sign for the Frame that reads, 'PARTY HERE' and set it out front on Party Days. One Of Our Obsessions ~ Vintage Bianchis! I always say, 'Deron and I do not have hobbies, we have obsessions.'! Funny thing... It is true. Deron also bought a Beautiful Pearl Blue, Older, call it Used, Bianchi Road Bike. We now ride them, right now, more than our other bikes. It seems we can and do ride faster and further on them. I had this idea of a Goal I would like to reach in 2019. 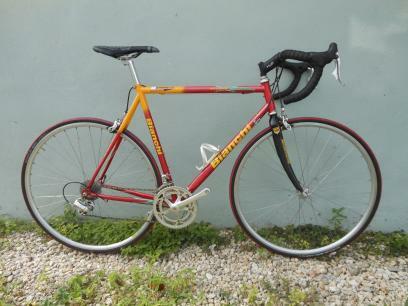 I not only want to ride a 62 mile ride, I want to do it on a, call it used, Road Bike that I have wrenched. What ever it might need, I would like to try to do it. Repack Wheels, New Tires, New Chain..... I would love to meet this goal. Deron thought it was a GREAT Idea and wants to do the same with me. So now? We are looking for, buying, used Bianchis, hoping for two 1998s (the year we hooked up) or 2001s (the year we got married)....or some other year that catches our Fancy! 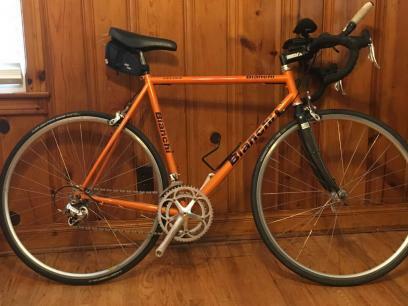 Deron found these Beautiful, Fall Colored Bianchi Road Bikes for a Song on Craigslist, No., Not near us, they were shipped in. The Red/Yellow Bike is a 2000 Veloche Road Bike. Lovely, ey? The Orange Pearl Colored Bike is a 1998 Veloche. Each as hard to find as the other....like my 1994 Pink (photo above). Each almost a Unicorn to find. 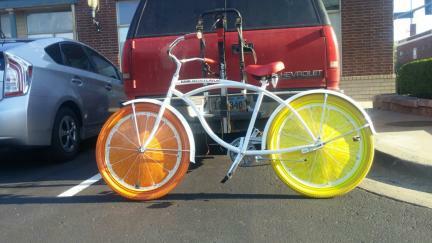 FUN WITH BICYCLES FOR DECOR! You have seen them. Those old, beautiful, some restored, some completely painted in one color, Bicycles sitting out for Decor. I had wanted one for yeeeears, but had no where to put it. Not that we did not have room in SD, but a waste out on the desolate prairie! Here! We can have such a thing. 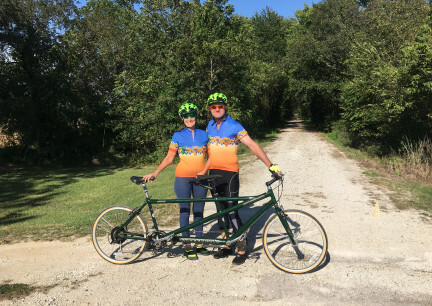 I was thrill to see people stopping on the KATY Trail to take photos of our bicycles out at the Trail in front of your home. We might, now, have more than one Display Bicycle. The contents of this page for Our Bicycle is still under construction. Please check back later. Dog Sleds, Scooters and More!